HMV taps into fashion headphone craze | What Hi-Fi? The craze for fashion headphones endorsed by pop stars such as Dr Dre and Lady Gaga looks like it could help save troubled music retailer HMV. A report in today's Guardian says high street music chains and online stores have been reporting bumper sales of hip-hop style 'cans'. So much so that HMV, faced by collapsing demand for CDs and DVDs, is now concentrating on selling accessories such as headphones, speakers and iPods instead. "When acts like Lady Gaga and Justin Bieber come in to our stores, it is to promote their headphones," HMV boss Simon Fox told The Guardian. The headphone market has nearly doubled in size in the past five years, with 8.2 million pairs expected to be sold in the UK this year, at a total value of £150m. Prices for fashion headphones can go as high as £350 and beyond. It's not only Dr Dre with his Monster Beats and Lady Gaga who have got in on the headphone act. 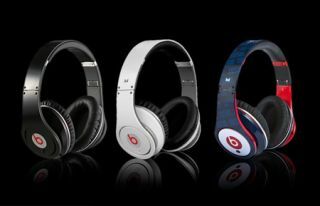 Bob Marley's family recently launched the 'House of Marley' range (right), and Monster released its Miles Davis-inspired 'Trumpet' headphones at CES 2011.